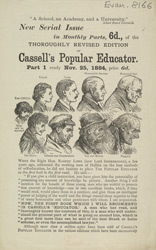 This leaflet is advertising Cassell’s Popular educator. Cassell’s have been established for over 150 years and have become very specialised become experts in publishing dictionaries and encyclopaedias. The illustration on this leaflet clearly suggests that this particular publication was very informative and that without this kind of education a life of idleness, drunkenness and beggary would follow. This leaflet also features a reccommendation for the publication from Robert Lowe, Lord Sherbrooke. Robert Lowe was a well known lawyer and MP in the late 19th century. He held a number of positions in parliament, being made Chancellor of the Exchequer in 1868 and then being moved to the position of Home Secretary in 1873. In 1880 he was created Viscount Sherbrooke and served the liberal party in the House of Lords.